It is amazing to think that I have been in London for nearly two months now. In many ways it still feels like I am still getting settled and am not even close to set up here. There is so much I want to see and do still that I am already thinking two years might not be long enough to have the full experience. The more I get used to London the more I love it. As I explained in my previous blog post it certainly isn’t all a bunch of roses, but in many ways, that makes it a better experience. When I came here I had the goals of finding work and a place to live as quickly as possible and, while it has taken a little while, I feel like I am finally realizing those goals. I am working pretty much every day as a supply (substitute) teacher and recently managed to find a beautiful apartment in Islington. I will be moving in on Wednesday with my friend from Vancouver, Guy, and his friend, Will, and finally I will have the chance to really settle into my life here. 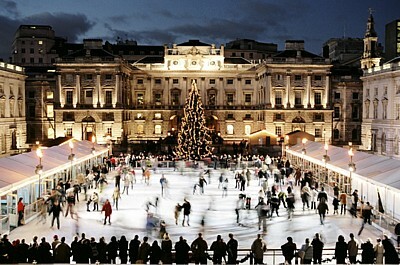 Ben and Louise) to ice skate at Somerset House on the outdoor rink just before Christmas. 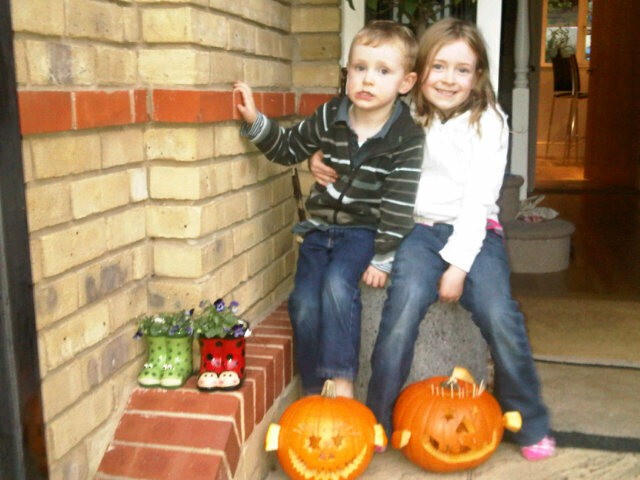 It will be so nice to do something Christmassy with them in London and it gives me something to really look forward to! My philosophy in London has been to try anything and everything, and so far it is really paying off. I am meeting people I probably wouldn’t have otherwise and having experiences I never thought I would. I spent a day wandering the streets of London dressed as a zombie for world zombie day, and within the next couple of weeks the plan is to go and see Wicked, the Andrew Lloyd Weber production. Add this to experiences such as dining at Jamie’s Italian and heading to Wembley stadium to watch rugby league and my time here has been incredibly diverse and fun. Even when I have nothing planned I try to make sure I do something as there is so much to see and do here. I spent a full day at the Tate Modern during the half term break looking at an exhibit by German artist Gerhard Richter, and went by St. Paul’s Cathedral (though it is a bit blocked off by the Occupy London protests). 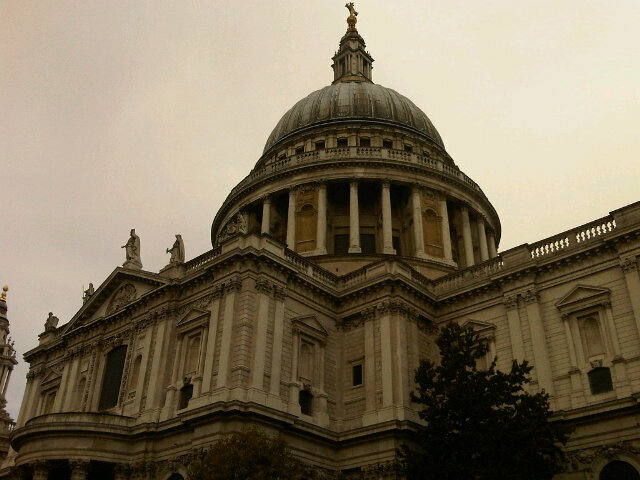 The architecture in London is worthy of spending a day looking at on its own, particularly all of the Christopher Wren designed buildings that dominate the city. As much as there still is to see in London I am also getting a strong urge to start traveling on the weekends and the holidays. Trips here are not all that expensive and there are so many wonderful places that are very accessible. Next weekend I will be leaving London for the first time since I arrived and heading to the beautiful city of Bath. I am lucky enough to have a friend, Ron, teaching there and a visit to see him is long overdue. Ron is a very keen traveler himself and has thrown out all sorts of ideas for trips in the upcoming months, so the tales and blog posts will hopefully only get better! I believe there is talk of Edinburgh for New Years Eve, a February ski trip to Andorra and a potential trip to Greece in June. I have to take advantages of all the holidays I get as a teacher! As the Christmas season approaches I have come to realize a few things about London. In particular, it is amazing the turnover of people that come through here. While I have already set up a good network of friends, as the holidays approach many of them are heading home. I feel this will be a bit of an ongoing theme while living here, but it is a positive thing. It forces me to always meet new people, to try new things and to make new friends rather than having things get stale or becoming set in my ways. The Christmas season will be a truly unique one for me this year, but I feel as though it could be incredible. I started my shopping yesterday by going to Harrods and will no doubt have to check out other shopping districts in London such as Regent Street, Sloane Square, Oxford Street, and the Camden markets. The lights have already been switched on (primarily by Justin Bieber) throughout the city, and as I head home from work every day the city looks incredible all lit up. I think this will only continue as we move into December. As I mentioned in my previous blog entry, I feel that my honeymoon period in London is now over and every day I begin to feel more and more like a local. The interesting part about living here has been getting to see the areas of the city that are not the major tourist attractions. The area I am moving into, Islington, is a very trendy neighbourhood with a good social scene and is not far from other nice areas such as Camden, Stratford, Shoreditch, and Brick Lane, so I am very excited to finally be moving into a new area of London. I am glad that I was able to spend 2 months in the Hammersmith and Kensington areas, but I feel as though the move to the northeast will better suit my lifestyle and will also put me much closer to most of the schools I teach at. It also allows me to be on a main tube line to Clapham, another amazing area of London where a lot of my friends live. London continues to amaze me every day, I could write an entire post (and I probably will) on the culture and the personalities of London and the UK in general. I have thoroughly enjoyed my two months over here so far and hope that my blog might even encourage some of you to come over for a visit! Hope that you are all doing well, I love the comments on my previous posts, thanks for all the support! Wembley from the inside. 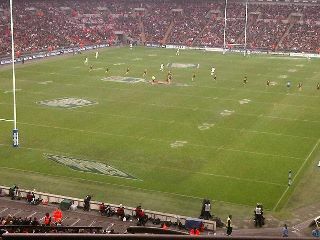 Kangaroos v England and Kiwis v Wales in Rugby League action.